Ziferblat: Are These Manchester's Weirdest Meeting Rooms? YOU'VE probably noticed over the last few years how certain companies (mostly techies) are trying to out-office each other. Check Buzzfeed.com or Mashable.com and you'll find them chocker with 'Coolest Offices In The World Ever' lists in which Google, Facebook or some bushy-tailed San Fran start-up have engineered a new office space where employees enter through a Tardis and surf down a 3D-printed waterslide to their desk hammock where free lattes are delivered via jetpack. Of course, you sit numb-arsed at your beige laminate desk from cheapofficecrap.com and curse the jammy, dorky sods. Manchester's at it too. Look up Allied London's Hello Hub digital hot desk project in Old Granada Studios, the BBC's Space Odyssey meeting pods in MediaCity, or Hulme-based web hosting firm, Melbourne, and their inside BBQ and Scalextric track. 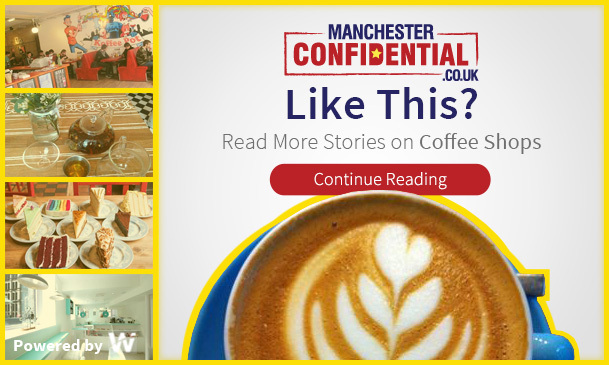 Now Ziferblat, Northern Quarter's Moscow-founded pay-per-minute 'anti-cafe' cafe, have upped their concept workspace game by opening up the second half of their Edge Street operation... with some curious results. "Blank space and bare walls are not inspiring," says Ben Davies, Ziferblat's Head of Marketing. "Meetings, conferences, training, they can all be incredibly dull and formal... we wanted to offer Manchester something more. "This has never been done by any Ziferblat anywhere in the world before," he continues, "so of course it had to be something special, something peculiar." During a short tour of the expansion we enter 'The Dining Room', which resembles some nightmarish recreation of an 80s' country house hotel wedding, minus guests, quiche and Babycham. The grotesque, hypnotic white rose wallpaper is only topped by a twelve quid Wilko chandelier and a mirror that appears to be giving birth to even more wallpaper. "It's, erm, well, 'orrible..." I say. "I know... isn't it great," replies Davies. "Like visiting your Nan's for Sunday Roast, it's soft, calming, intimate. The next room, 'The Class Room', is modelled on a primary school class room, featuring play mats, finger paints, chalkboards and sing-a-long guitars. "It's supposed to be nostalgic... playful" says Davies. It reminds me of getting my arsed tanned. 'The Studio' is a large, bright blank canvas room in which Ziferblat have recently hosted a 'Zifermarket', acting classes and a Breaking Bad binge-watching day. "Perfect for a hungover Sunday," says Davies. The last of the new rooms, 'The Meetin Room', is yet to finished but will be a homage to Ziferblat-founder and poet-turned-entrepreneur, Ivan Meetin, and will supposedly be decked out in the style of his Russian ancestors. 'More Dr Zhivago than Trans-Siberian Railway', we're told. All of Ziferblat's new rooms are bookable for meetings at 5p per person per minute with a minimum spend (from £30-£150) applied to each room. Now fifteen branches strong in cities such as Moscow, London, St Petersburg and Prague, the Manchester branch is the biggest and busiest of all Ziferblats, having welcomed over 23,000 since opening in January 2015 (roughly 190 people per day). Manchester also recently smashed the Ziferblat world record by welcoming 417 guests in one day. "We thought we'd be popular," says Davies, "But we've smashed all of our expectations. "That's the reason we're currently looking for a second Manchester site and will then look to branch out into more Northern cities - we want a Ziferblat in every University city in the country." The second site is expectred to open before 2016.